September | 2012 | What Next? Today is Mid Autumn Festival in Hong Kong. I miss it. Mid Autumn Festival is the Chinese version of Thanksgiving. 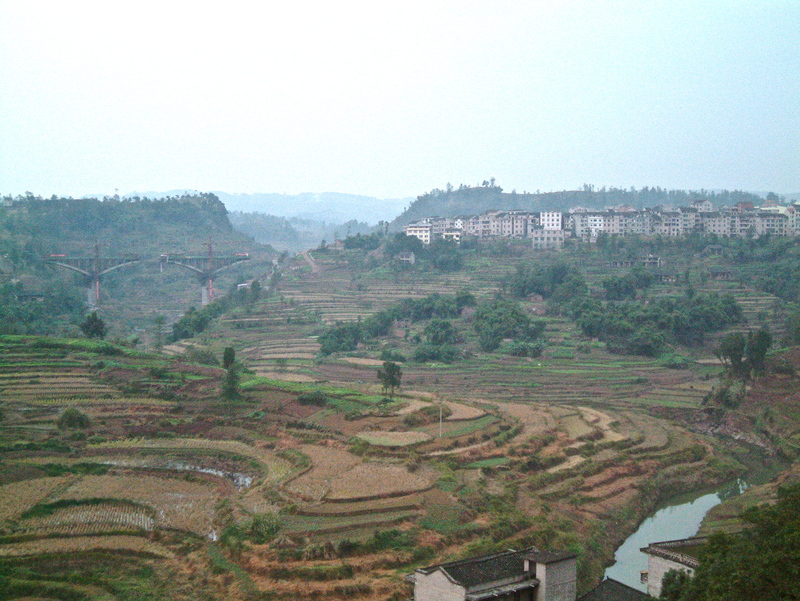 Originally the festival marked the end of the rice harvest and families went to the mountains to have picnics. Today it celebrates the beauty of the autumn moon and is also called the Lunar Holiday. 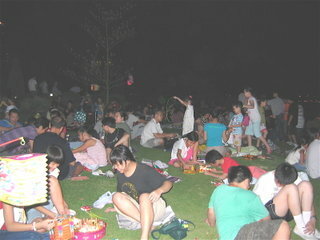 In Hong Kong families and friends gather in parks or go down to the ocean after dark. They carry lanterns or glow sticks. They light candles and spread out blankets for picnics. The food associated with Mid Autumn Festival is mooncakes and the school I taught at in Hong Kong distributed them to all the students’ families along with a request for donations to our school. Mooncakes are sold everywhere during Mid Autumn season and in some shops all year round. I received dozens as gifts from my students. There are many different kinds. Traditional ones are filled with egg yolk, lotus seed paste and coconut. Some have a red bean filling. They are very rich. I was told one mooncake has the same number of calories as five bowls of rice. I tried several different kinds but admit they weren’t my favorite. I think it was around 2007 when I noticed how popular icecream mooncakes were becoming. Hagen Daz made them and during Mid Autumn Festival week there would be huge line-ups at their stores. Mooncakes have a historical significance. Apparently when China was under Mongol rule an army commander sent the citizens of several towns mooncakes the evening before the festival. Tucked inside them were notes telling the people to rise up at midnight and kill the Mongols. The surprise attack was a success and with the help of the rebel army the Mongols were chased out of the country. I’ll never forget my first Mid Autumn Festival in Hong Kong. The night before the Mid Autumn Festival our doorbell rang at 10:00. There at the door stood one of my students and his father. They brought us a huge basket of fruit and stayed to visit for about half an hour. 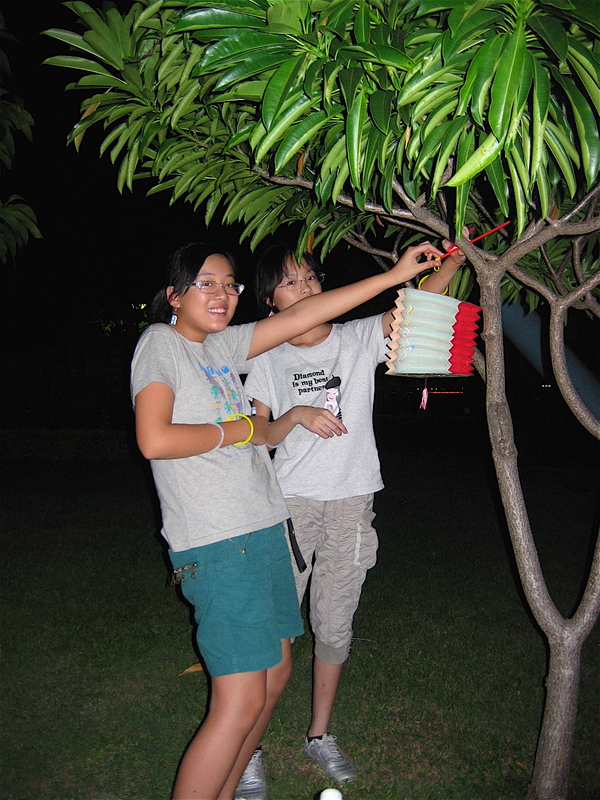 For our first Mid Autumn Festival evening a teacher from our school invited us to his home near the Hong Kong harbor. Upon our arrival we were warmly welcomed by the friends and family who had gathered together to celebrate. We had a potluck supper and then headed down to the beach. Our hosts provided us each with a candle-lit paper lantern to carry. The children were waving light sticks and had on phosphorescent necklaces and bracelets. Hundreds of families were heading down to the water carrying lanterns. Even the dogs we saw were wearing “glow in the dark” collars. At the beach, we picked a spot to sit down and put dozens of small red candles in the sand. We lit them and sat around our burning circle of light visiting and singing. The moon was gorgeous and the beach was full of families, each with their own little candle fire enjoying the lunar magic and one another’s company. Apparently some would stay near the water for most of the night. We left around eleven thirty. When we arrived home the children in our apartment block were still outside enjoying a penny carnival the building management had set up in the courtyard. The gates and walls were decorated with lights. Lanterns were strung up everywhere. We heard the kids talking and laughing long after we went to bed. In subsequent years we continued to celebrate with friends. 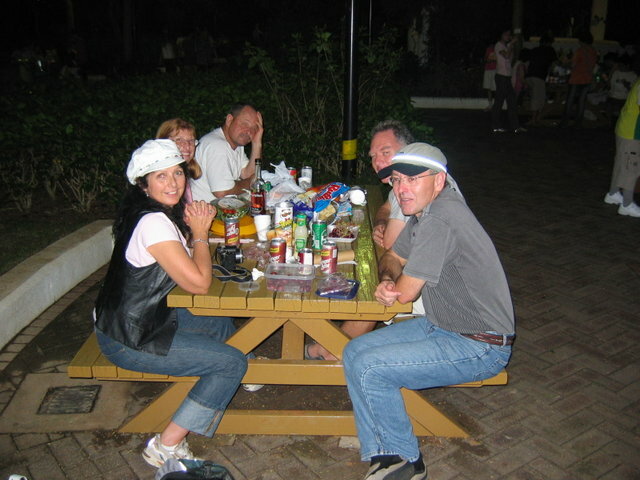 Here we are in Ma On Shan Park with colleagues on Mid Autumn Festival night. This year I’m hosting my extended family for a Thanksgiving meal a week before Canadian Thanksgiving, because of family travel plans, so we will be celebrating exactly on the Mid Autumn Festival Day. We’ll have our own little Chinese Thanksgiving here in Winnipeg. My husband was gone for four days on a golf trip so I decided to indulge in a Jane Austen film festival in his absence. I watched six movies– Persuasion, Mansfield Park, Pride and Prejudice, Emma, Sense and Sensibility and Northanger Abbey. I had reread all these Austen books during the last year or so; but watching the stories one after the other, I observed new things they had in common. I liked watching the elegant English Country dancing in almost all of the films. Their patterns are lovely but complicated. The many different steps must have been hard to master. How many hours did they practice? Key scenes in many of the films take place at dances. I noted that clergymen figured prominently in most of the novels. Three of them Edmund Bertram in Mansfield Park, Edward Ferrars in Sense and Sensibility and Henry Tilney in Northanger Abbey are admirable, intelligent and of good character even though they are not perfect. Two of them Mr. Elton in Emma and Mr. Collins in Pride and Prejudice are foolish and vain. 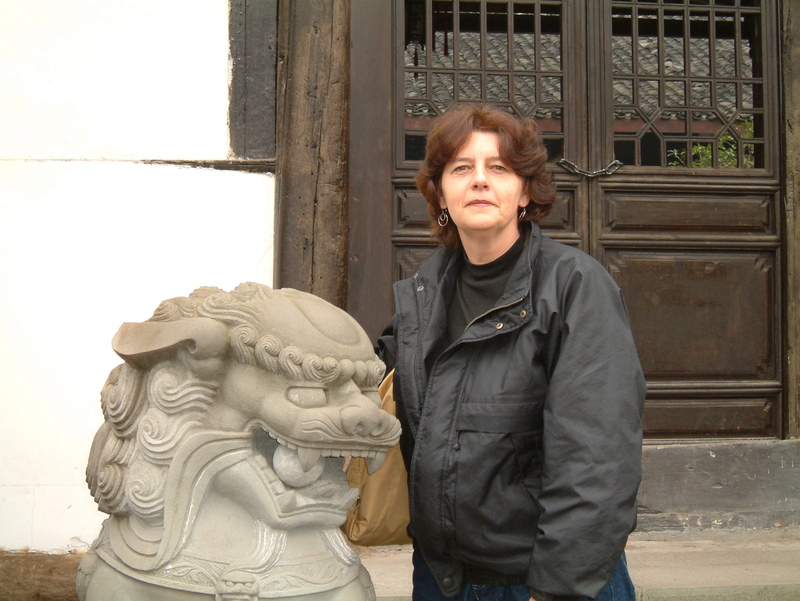 All Jane’s main characters have an independent, assertive streak that is admirable. In Northanger Abbey Catherine is brave enough to want to explore the mysteries of the Tilney family. Fanny in Mansfield Park refuses to marry Mr. Crawford despite the fact that everyone else seems to think she should. It is Elinor in Sense and Sensibility who takes charge and organizes things for her family when her stepbrother and his wife fail to support them. Elizabeth is not afraid to tell Mr. Darcy exactly what she thinks of him in Pride and Prejudice. Despite the noteworthy confidence of the Austen women, watching the films made me realize again how lucky I am to live in a time when women are not dependent on men and marriage to make their way in the world, as was the case in the time of the Austen novels. I am also struck by how both men and women in the Austen novels were being forced to marry for money. It seemed a key consideration. Perhaps it is still an important factor in many marriages. Watching all those movies in such short order got me thinking about what Jane Austen is trying to tell us about marriage. She does think we should marry for love and not for wealth or appearance. However she does warn us not be so taken in by flashy, passionate romance that we fail to notice if the object of our affection is not a man of character, worthy of respect. Marianne Dashwood for example in Sense and Sensibility falls for the dashing Mr. Willoughby and is sick at heart when he rejects her, but in the end discovers that Colonel Brandon’s love is much more worthy and dependable and perhaps every bit as passionate. We never get to know any of the servants in the stories. Sure some of them have a few words to say, but they are never treated as real characters and the main protagonists in the films don’t develop close relationships with them. I wrote a post in March called A Lament for Letters. I noticed how many letters Austen characters received and sent and what an important role they played in the films. In Pride and Prejudice Mr. Darcy writes a letter to Elizabeth to explain why he treated Mr. Wickham as he did. In Sense and Sensibility Marianne Dashwood receives her final rejection from Willoughby by letter. In Northanger Abbey Catherine’s brother James sends her a letter to let her know his engagement to Isabella has been broken off. While Fanny is away from Mansfield Park she receives letters keeping her abreast of what is going on there. On this website you can answer 40 questions and find out which of Jane Austen’s heroines you most resemble. Supposedly I am most like Emma Woodhouse from Emma. The survey notwithstanding I am drawn to Elinor Dashwood for some reason, especially the way Emma Thompson portrays her in the film version of Sense and Sensibility. Pride and Prejudice however remains my favorite novel. I recently read PD James Death Comes to Pemberley just so I could revisit the characters. Why would you need to read the passionate Fifty Shades trilogy at the top of the best seller lists these days when you can have the gentle romance of Jane Austen? 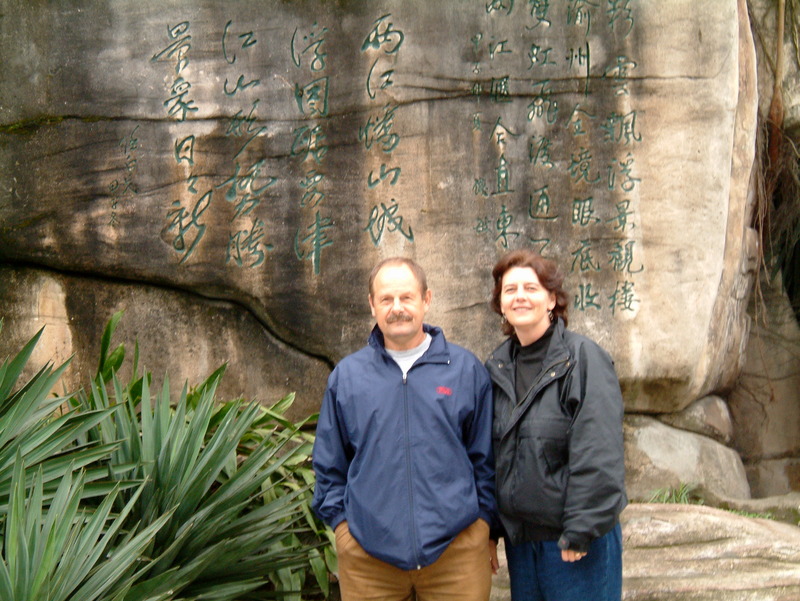 I did a post a couple days ago about our trip down the Yangtze River. 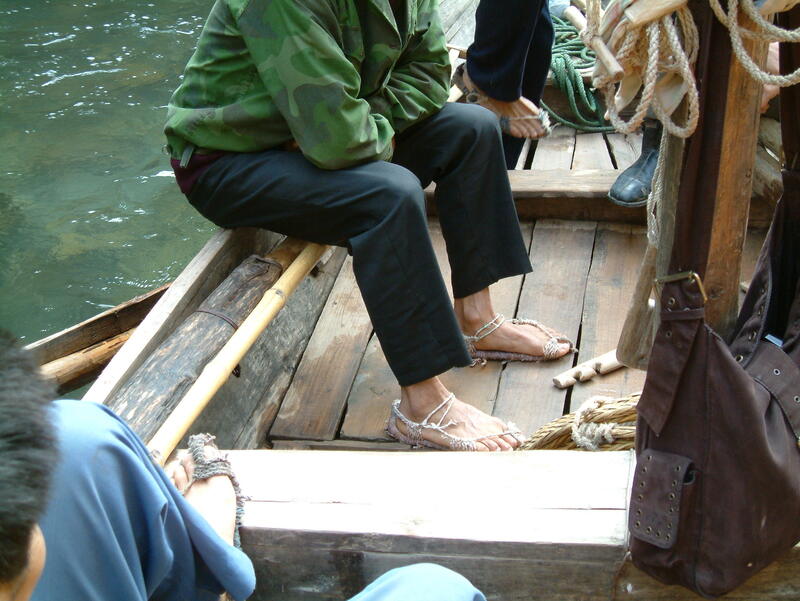 The most interesting person I met on that trip was Zhuo de Li a 68-year-old boat tracker. Two or three times a week he and his crew of six men paddle groups of visitors through the Bamboo Gorge. The narrow waterway is a branch of the Shenong River in China’s Hubei province. I was lucky enough to be a passenger on Mr. Zhou de Li’s boat. I say lucky, because Mr. Li has been plying the sometimes-turbulent waters of the Bamboo Gorge for the last forty years. I couldn’t have been in the hands of a more experienced oarsman. 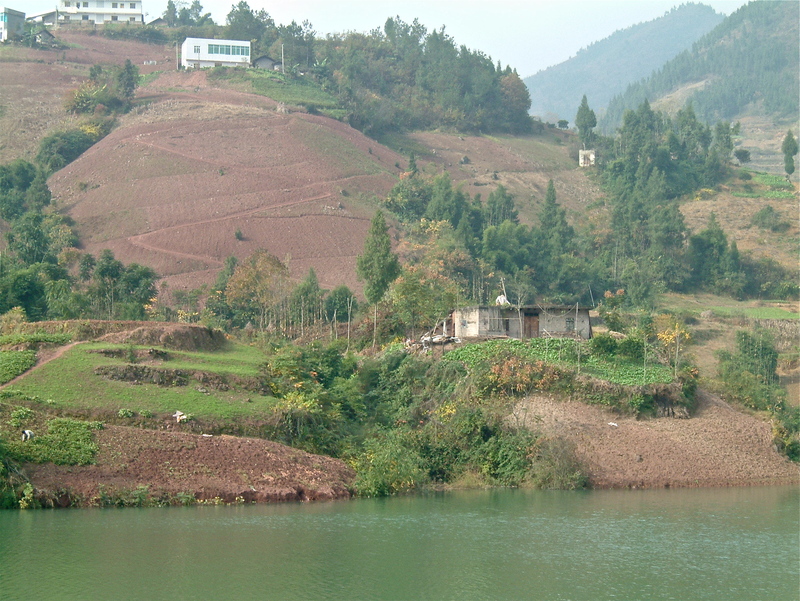 The vessels built by Zhou and his fellow Tujia tribesmen are called pea pod boats. Originally they were used to carry supplies, produce and local folks to and from their villages along the tributaries of the Yangtze River. Recently however they have also become available as a means of transportation for tourists who want to explore the narrower chasms in China’s scenic Three Gorges region. The local interpreter who accompanied us obligingly relayed my questions to Mr. Li when I told her I wanted to interview the hardworking man maneuvering our boat. As the guide translated I found out boat tracking is a career which requires years of practice. Mr. Li learned how to build pea pod boats and their unique paddles from his father. 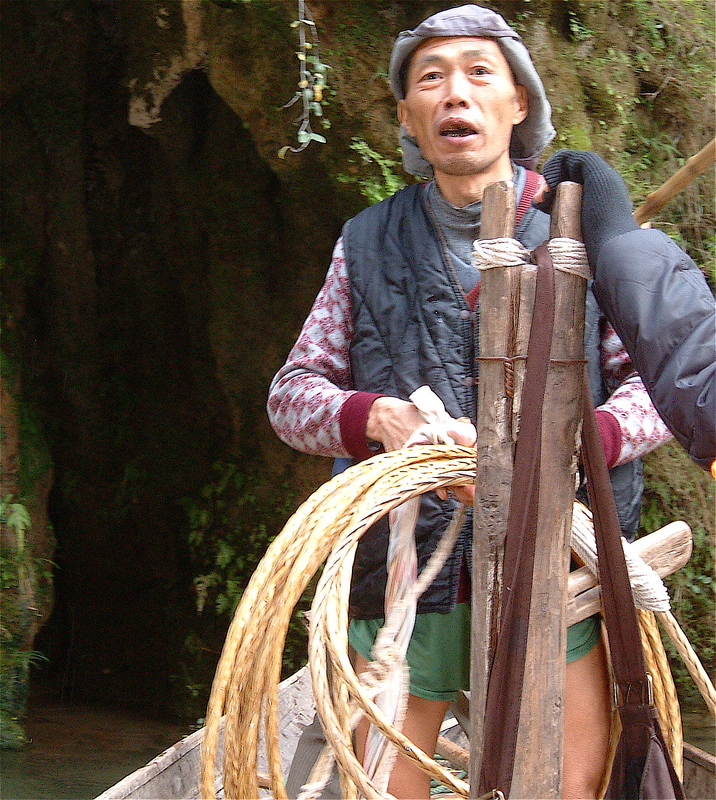 Other Tujia tribesmen taught him to make the strong ropes that are used by the trackers to guide the boats when necessary. At certain spots where the Shenong River becomes just a narrow, shallow stream the trackers wrap the ropes around their bodies, jump overboard and head for the rocky shore. Here they pull the boat forward in a display of strength and endurance that is truly amazing. Just as Mr. Li learned to be a boat tracker from his father so he has taught his own three sons the skills required. They are now part of his crew. Guiding a boat down the Bamboo Gorge is no easy task. The paddlers sing together as they work. Mr. Li said the songs help keep their oar strokes evenly matched and provide encouragement for the difficult task. He joked saying Tujia women find men who are good singers very attractive. According to Mr. Li, the best singers get the best wives. It was very cold the day I traveled the Shenong Stream. Yet Mr. Li and his fellow trackers wore shorts. When they were required to jump into the water, bare legs were more convenient. Apparently the trackers used to make these trips without any clothes on at all, but in deference to tourists have begun to wear them. I was most intrigued by the Tujia men’s’ shoes. They are thin sandals of knotted rope, which protect their feet from the sharp rocks on the shoreline. Mr. Li said his wife makes his shoes. She also cares for their farm while her husband and sons are out on boat trips. The tourists provide a welcome addition to the Li family finances. The thirty men from Mr. Li’s village who work on the boats each make about $12 (Canadian) a week. 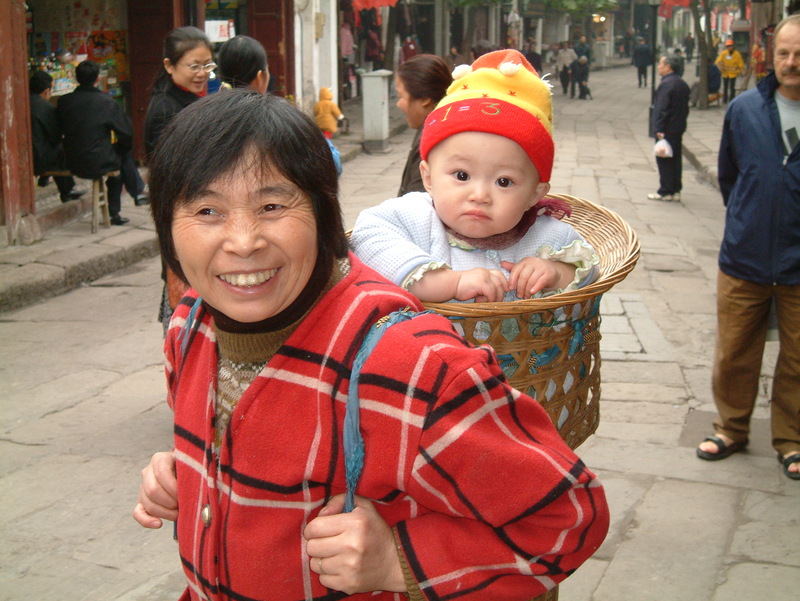 This provides a real boost to the economy of the local Tujia tribes. Before we left Shenong Stream I had the guide ask Mr. Li how long he thought he’d continue being a tracker. He laughed and said he knew of a man who had worked on the boats until age 78. Who knows? 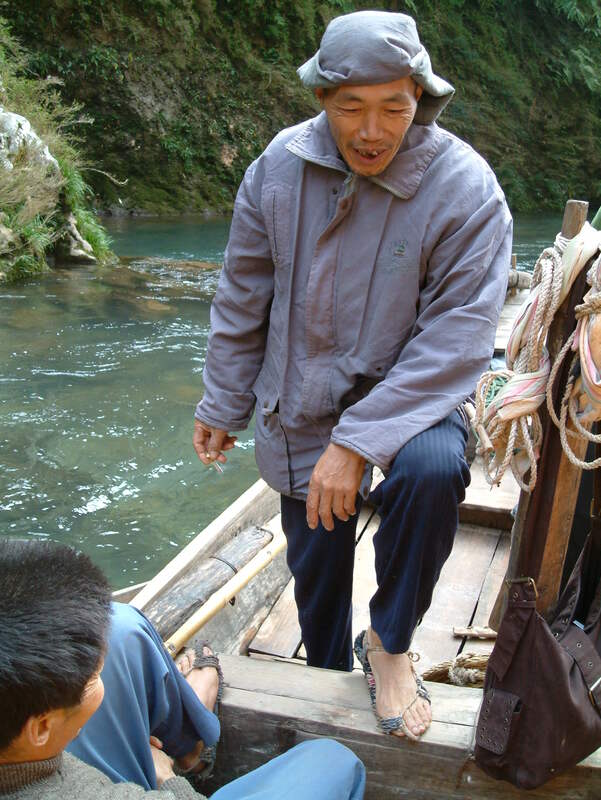 Maybe by now Mr. Li is not only paddling the Bamboo Gorge with his sons but with one of his grandsons as well. 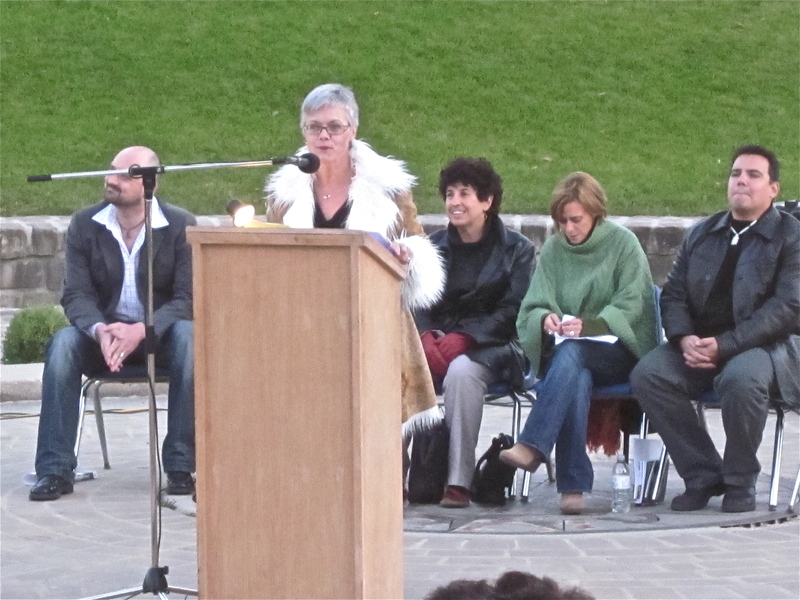 I’ve had an enjoyable time at the Thin Air Writers Festival. You can read all about it on my blog Destination Winnipeg. My Aunt Mary once pointed out this verse from the book of Psalms to me and I’ve never forgotten it. The idea that there is someone acknowledging our grief, writing an account of our sorrow, and collecting our tears to keep as a remembrance is comforting. Were we to keep track of all the sadness we experience in a lifetime we might become so weighed down with its burden we would have no time to appreciate and savor the many good things life also brings our way. We can be reassured our sorrow is never forgotten. This makes it possible for us to put the lid on the bottle of our tears perhaps in the beginning for only a short while, and eventually for longer periods of time. It enables us to close the book on our grief gradually, knowing a record has been kept and we are not betraying anyone’s memory or forgetting the intensity of the sorrow we experienced because we know it was important enough to be written down. This frees us to begin to write new and healing words, lines, pages and eventually chapters in our ongoing life story. I’ve been thinking about that verse ever since I heard about the sudden death of a man who was part of my high school graduating class. We attended the same church for several decades and his sons were friends with mine. What can possibly bring solace to those who loved him? I know his family has a strong faith and a supportive faith community. Hopefully the knowledge that God is counting and acknowledging every tear they cry, and is grieving as they grieve, will be a source of comfort. The process of collecting tears isn’t just a literary image. It has been a practice for centuries. Around the time of Jesus it was common for Romans to collect tears in bottles when someone died and place them in the deceased person’s tomb with them. The more tears you collected the more important the person was said to be. During the Victorian period tears were collected in special bottles that had stoppers which allowed the tears to evaporate. When the tears were all gone, the period of mourning was officially over. During the American Civil War women collected the tears they cried as their husbands and sons went off to war. They saved the tears until their men had returned home safely. Sadly many of their loved ones never came back. Children’s author Arnold Lobel has written a heart warming story about tear collection called Tear Water Tea in his book Owl At Home. When owl remembers the sad things in life he cries and he collects the tears he cries in a kettle. He heats his tear water on the stove, makes tea with it, drinks the tea and is comforted. We cry millions of tears in a lifetime. We may not remember them all, but that doesn’t mean they lose their significance or importance. They are noted. They count. They are collected and recorded by a compassionate God. There are many metaphors for God. I especially appreciate the feminine metaphors included in the Bible that compare God to a human mother, a mother hen, a mother bear, a mother eagle and a woman searching for a lost coin. There are dozens of metaphors for God in Scripture– rock,shepherd,light, wind, father and king. But until I heard Richard Kearney interviewed on the CBC radio program IDEAS I had never considered the metaphor of the stranger for God. Kearny reminds us God came to Abraham and Sarah in the guise of three strangers to tell them the news they were to become parents. Abraham and Sarah welcomed the strangers and gave them food. Kearny points out that when the Russian Orthodox painter Andrei Rublev created his famous icon of the Trinity he chose to portray them as the three strangers who visited Abraham and Sarah. because Mary does look somewhat hesitant about accepting this strange being and his astounding news. Mary is reaching her hand to the stranger at the same time as she is backing away from him. After Jesus’ resurrection he appears as a stranger. Mary mistakes him for the gardener and the two fellow travelers who chat with Jesus on the road to Emmaus don’t recognize him. What does the metaphor of God as stranger teach us? We are so often wary of strangers, yet if strangers’ faces reflect the face of God then we owe them a smile, a listening ear and perhaps even an invitation to share food with us. This week here in Winnipeg a news story about a city transit driver who stopped his bus on a chilly morning to get out and give his shoes to a barefoot stranger has garnered international attention. The bus driver seems surprised at all the fanfare he’s receiving. He thinks most people would do the same thing he did if they saw a stranger in need. What if God was one of us……………….. just a stranger on the bus trying to make his way home? 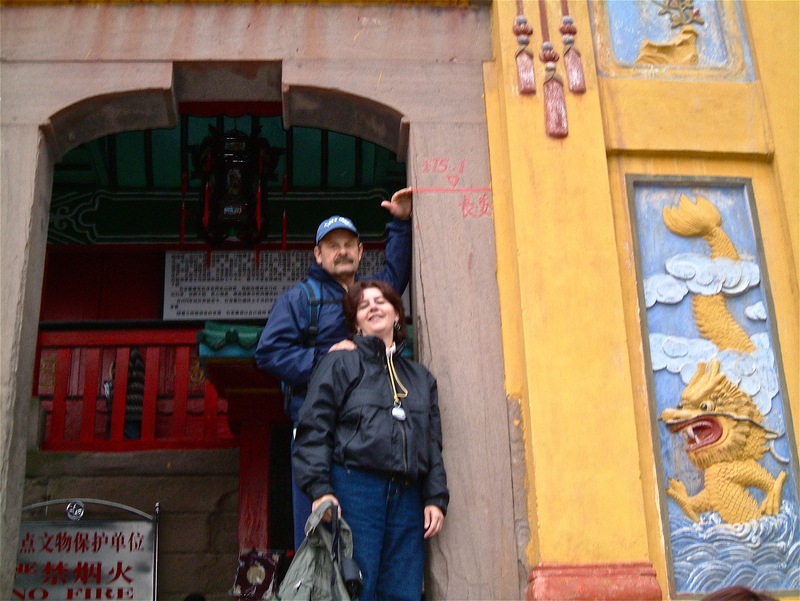 Dave and I stand outside a temple on the Yangtze River in 2004. Dave is pointing to a mark by the temple door. We were told the waters of the river would reach that height on the temple when the Three Gorges Dam project was complete. The project was finally declared complete this past July according to this Reuters article. The Chinese government built the dam to provide hydro-electric power and to control the flooding of the Yangtze. I was reminded of our trip down the Yangtze River by a photo taken by Edward Burtynsky called Feng Ji #9. It is on display at the Winnipeg Art Gallery and I often point it out to visitors on the tours I give at the gallery. It is one of a series of photographs taken by Burtynsky to show the effects of the Three Gorges Project. Burtynsky is a photographer who specializes in capturing the landscapes created by what he calls the ‘plunder of the earth.’ You can see Burtynsky’s Three Gorges images, on his website. Over a million people lost their homes as the Three Gorges Dam was built and the Yangtze River rose. Four hundred year old houses and eight hundred year old bridges were demolished. Terraced fields that represented centuries of hard labor by local farmers were washed away along with palm trees, lush vegetation, factories, schools and apartment buildings. Winding mountain access roads which communities worked together for generations to build with pick axes and shovels are gone. Also tragic is the loss of thousands of cultural and historical relics. Temples, statues and monuments disappeared under the rising waters. We saw White Crane Ridge a rocky outcrop near the city of Fuling. It contains twenty carved pictures and over 300,000 Chinese characters which record the history of the river beginning in the year 763. It is now underwater although the Chinese government has turned it into an underwater museum. At one point our river guide pointed to writing on the cliff walls. These are recently painted versions of original poems which have already been submerged by the flooding. Each Chinese emperor penned some literary verse after observing the beauty of the Yangtze’s Three Gorges. Artists then carved their words into the rock. All this poetry dating back thousands of years, now lies under the water, to be viewed only by fish and the occasional fool hardy scuba diver. 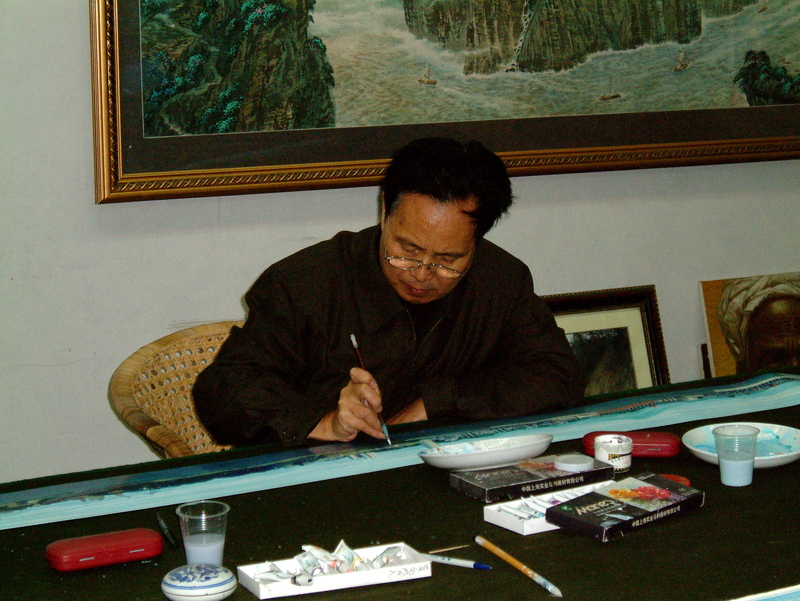 In the city of Chongqing we met artist, Lui Zuo Zhong. For twenty years he hiked the regions that were to be flooded taking thousands of photographs and doing hundreds of sketches of the people, scenery and landmarks. Mr. Zhong has worked tirelessly to create a painting as long as a football field which depicts the riverbank of the Yangtze before the flooding began. Although he does not have the proper funding to display the mural in a climate controlled setting, he has opened a small outdoor museum where his work of art hangs under a tin roof. 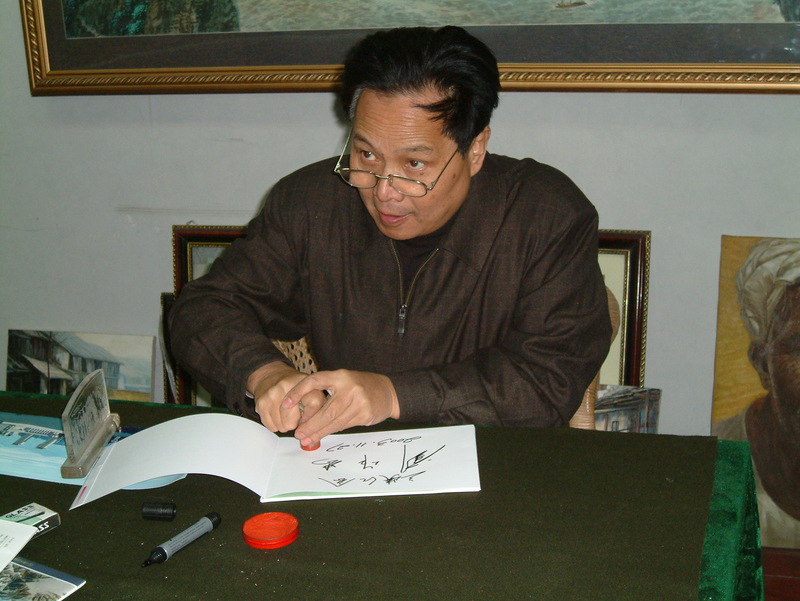 He autographs and sells printed reproductions to fund his fight to preserve the unique beauty and culture of the rapidly disappearing Yangtze Three Gorges Region. 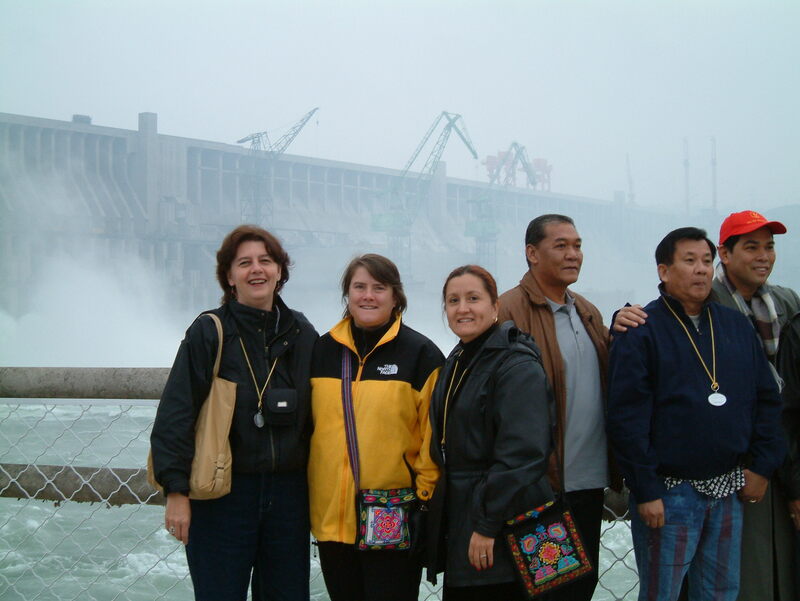 Here I’m standing at the Three Gorges Dam with some of our traveling companions. 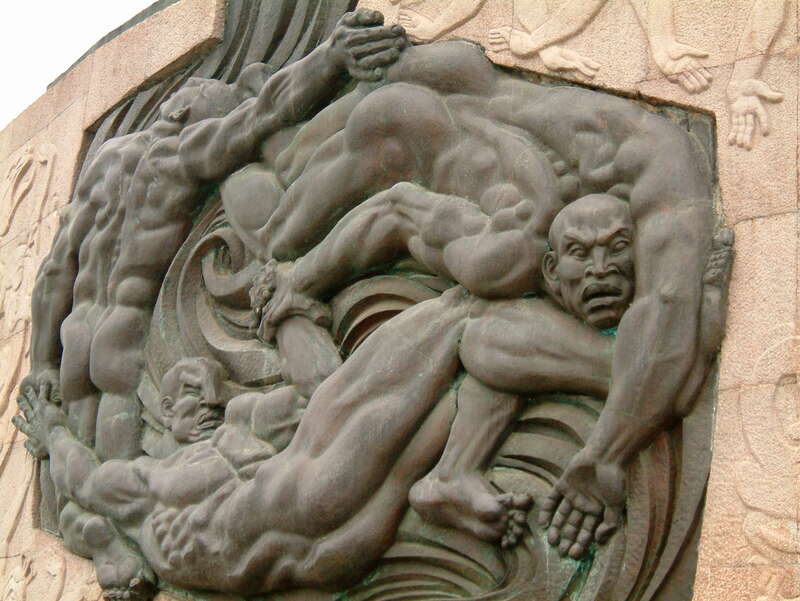 This art piece is said to show the Chinese people fighting with the Yangtze. Over the years the river has caused flooding and destruction. In building the Three Gorges Dam China believes that at last they have conquered the Yangtze, harnessing its power to provide electricity to a nation. But at what cost?